Living in Los Angeles has a lot of pros and cons. Driving to Santa Monica in traffic every day is definitely a negative! From an autograph collecting standpoint it is a slice of heaven! Everybody who is anybody seems to be in LA at one time or another. 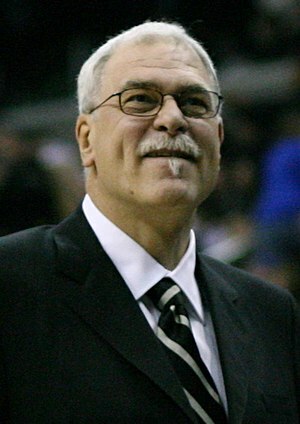 Today’s blog centers on the now former coach of the Los Angeles Lakers, Phil Jackson. Over the years, I have the good fortune to run into the Basketball Hall of Fame coach on numerous occasions. Every time, I found him to be very kind and generous with me and, everyone he dealt with. Once at the Staples Center after a game, I chatted with him for about ten minutes covering what seemed to be every topic under the sun. Coach Jackson is a very funny, clever man with a hilarious sense of humor. He also loves talking about his playing days with the New York Knicks. If you ever get the chance to meet Phil Jackson, you are in for a treat! This entry was posted in Uncategorized and tagged Chicago Bulls, Derek Fisher, Kobe Bryant, Michale Jordan, Scottie Pippen, Shaq. Bookmark the permalink.